Choosing a domain name may seem simple at face value, but once you dive into the nitty-gritty, it can quickly become complicated. When you follow the guidelines below, you can successfully choose the best domain name to represent your business, personal brand, or blog. Use a “.com”. This is the most widely accepted domain name extension, especially for business purposes. 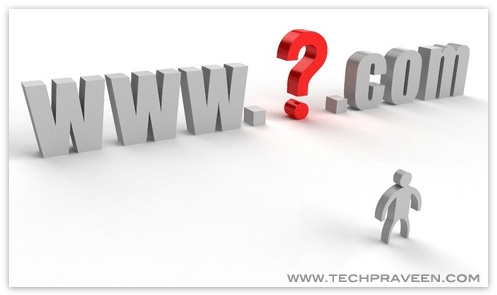 If you have a business, using a.com domain name will immediately boost your credibility. This is also helpful if customers can’t remember your domain name and choose to type in your business name plus .com. More often than not, that will help them easily find your website. Choose a shorter domain name. The shorter that your domain name is, the easier it will be for visitors and customers to remember. And if visitors can easily remember your domain name, then they will pass along to their friends and revisit your website again and again. If your domain name is long and complicated, it will make it even more difficult for interested customers to find your brand or personal blog. Try not to use hyphens. If at all possible, try not to use hyphens in your domain name. The main issue with a hyphenated domain name is that visitors will forget where to place the hyphens. Or, customers may neglect to insert hyphens altogether, leading them to a competitor’s website. If your domain name is already taken, consider choosing an alternate name instead of using a hyphenated version. Go based off of keywords. If you are not going to use your business name in your domain name, then choose the most widely searched or most marketable keywords to insert into your domain name. This will make it easier for customers searching on a specific topic to find your website or blog, such as “bookreviews.com”. Consider a discounted domain name. For a brand-new domain name, it is going to cost you roughly $10 per year. Many times, you can scoop up a domain name at an auction from someone else hoping to sell an existing domain name for as low as $5. Depending upon how competitive a domain name is, and how valuable it is to you, you could pay in the thousands of dollars for a very exclusive or in demand domain name in these types of auctions. Bottom line? Putting thought into your domain name will make a difference. This is one of the simplest ways to make or break the success of your website and to naturally increase your traffic. Bethany Ramos is a full-time freelance writer through Elance.com. For more information on top registry cleaners to speed up you PC, you can visit her Registry Repair website. Com is the best and the most reliable domain name and I am ready to pay more for it as it is well-accepted and recognized. It’s very important to include your keywords at the very beginning for Google to find your site easier and for better optimization. And also, I’m thinking about .net domain. Is it as good as .com? Choosing a domain name can be headache at times. Nice tips. Thanks..!! Before choosing the right domain you need to start with keyword research, because with that you can have an overview which among your keywords is the best one to use on the domain as long as it is not use by someone. Choosing domain names is not easy it can be confusing at times even if it is a personal blog, the domain name should be catchy, interesting and easy to remember, you also see to it that the keyword is still available. So thanks for giving out information about choosing domain names. Great post!choosing domain was already interesting or to use it.thanks for sharing your idea to us. Keep it up!